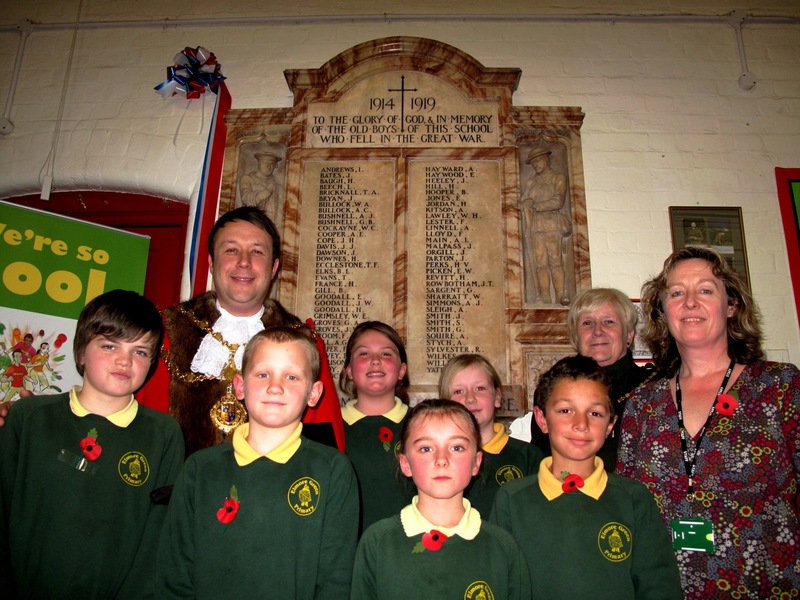 Walsall's Mayor and Mayoress joined pupils, staff and guests to wintness the rededication. Today in Bloxwich Armistice Day was marked in a particularly poignant manner by the rededication of a school war memorial which commemorates the sacrifice made by former pupils of Elmore Green School in the Great War. Elmore Green School War Memorial - click to enlarge. The memorial, listing sixty-seven ‘old boys’ of what was then Elmore Green Central School, later High School, who gave their young lives in “the war to end all wars”, had been moved in 1958 when the secondary functions of Elmore Green High were transferred to the new T.P. Riley Comprehensive, not far away in Lichfield Road. Over the following years, various people including Bloxwich local historians Edna Marshall, Barry Crutchley and ex-T.P. Riley history teacher Ken Wayman, had tried to find and raise the profile of the missing memorial and eventually, following convoluted enquiries via the Academy and within Walsall Council departmens, in late 2010 it was tracked down to the premises of monumental masons A. Walker & Sons of Cannock, who had been storing it safely since the demolition of T.P. Riley years ago. 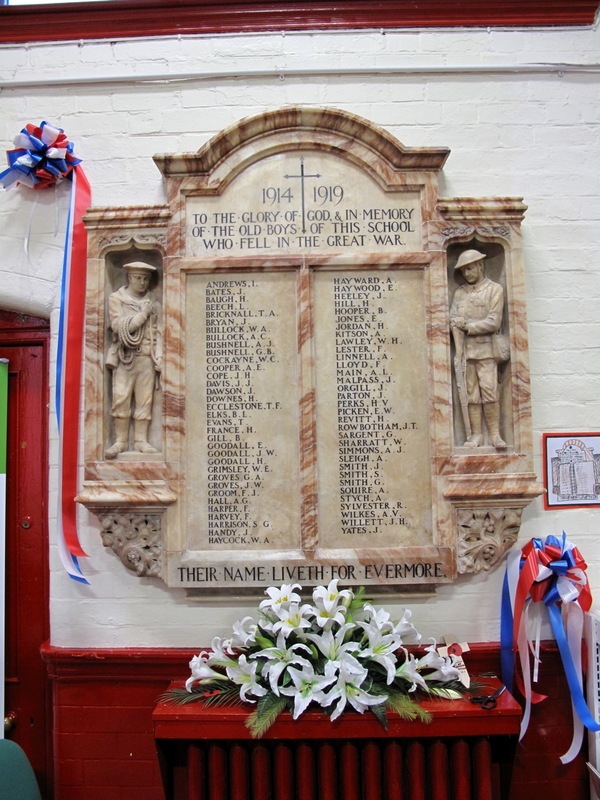 Following work done by Walsall Council officers Elaine Box and Mike Gaffney, funding was found from the Council to have the memorial returned to its original home in March of this year, when it was mounted on the wall of the school hall by the masons who had preserved it. Today, the memorial finally came home in a spiritual sense, during a poignant and emotionally-charged Armistice Day service held at what is now Elmore Green Primary School, in the presence of the junior school children and staff, relatives of those listed on the memorial, local people, clergy from both Anglican and Methodist churches and the Mayor and Mayoress of Walsall. In the bright and airy school hall, decorated with symbols and displays of remembrance made by pupils, who had taken the theme on as a class project, everyone gathered at 2pm to witness the formal rededication of the memorial. Jane Humphreys, Headteacher of Elmore Green School, welcomed one and all and presided over the event which, deliberately echoing the original service of dedication in March 1922, ran liked clockwork thanks to staff and children alike. The service begins, in the presence of the Mayor and Mayoress. Reverend Phil Hoar of St John’s Methodist Church first spoke eloquently of the history of the Great War of 1914-18, and was followed by the junior pupils singing the hymn ‘For all the Saints who from their labours rest,’ accompaniment on the piano being played throughout and later by Derek Willets. Camille Sutton and Luke Little. Next, year 5/6 pupil Luke Little recited his own powerful poem about the soldiers’ war and its horrors. He was followed in turn by Camille Sutton, also of year 5/6, with her thoughtful version of a soldier’s war diary. Then Reverend Hoar led a prayer to remember the fallen, which was followed by a reading on Wisdom by Reverend Roger Williams of All Saints Parish Church. Following this, the junior pupils rose and turned, row on row, to recited the Roll of Honour to the assembled audience, after which pupils sang ‘Keep the Home Fires Burning’. Reciting the Roll of Honour. There was then a pause as the Mayor of Walsall, Councillor Garry Perry, accompanied by the Mayoress Mrs June Perry, stood to speak on the subject and symbolism of remembrance, of war, the fallen, the importance of learning from the past to shape a better future, and of the promise shown by the youngsters who had done such a fine job this afternoon. He was very proud of them, and proud to be a part of this rededication in Bloxwich, a true highlight of his year as Mayor. Reverend Roger Williams leads the Prayer of Dedication. The Mayor then cut a ceremonial ribbon across the war memorial, and Reverend Roger Williams conducted a Prayer of Dedication before the marble sculpture. Finally, the Last Post was played, followed by a minute’s silence, and all present sang the National Anthem before concluding remarks by the Headteacher. The service was over, and there was time for reflection, to view the memorial, and for refreshments before departing. A rare privilege; we are unlikely to see such an event again, and what better way to mark Armistice Day in the ancient English village of Bloxwich? Today is Armistice Day. It commemorates the armistice signed between the Allies of the Great War of 1914-1918 and Germany at Compiègne, France, for the cessation of hostilities on the Western Front, which took effect at eleven o’clock in the morning — the “eleventh hour of the eleventh day of the eleventh month” of 1918. Many people today are not aware, however, that while this official date to mark the end of the war reflects the cease fire on the Western Front, hostilities continued in other regions, especially across the former Russian Empire and in parts of the oldOttoman Empire. After World War II, the name of the holiday was changed to Veterans Day in the United States and to Remembrance Day in countries of the British Commonwealth of Nations. Armistice Day remains an official holiday in France and Belgium, known also as the Day of Peace in the Flanders Fields. In many parts of the world, people take a two-minute moment of silence at 11am local time as a sign of respect for the roughly twenty million people who died in the war. This gesture of respect was suggested by Edward George Honey in a letter to a British newspaper, although Wellesley Tudor Pole had established two ceremonial periods of remembrance based on events in 1917. From the outset, many veterans in many countries also utilised Silence to pay homage to departed comrades. The toast of “Fallen” or “Absent Comrades” has always been honoured in silence at New Zealand veteran functions, while the news of a member’s death has similarly been observed in silence at meetings. Similar ceremonies developed in other countries during the inter-war period. In South Africa, for example, the Memorable Order of Tin Hats had by the late 1920s developed a ceremony whereby the toast of “Fallen Comrades” was observed not only in silence but darkness, all except for the “Light of Remembrance”, with the ceremony ending with the Order’s anthem “Old Soldiers Never Die”. In Australia, meanwhile, the South Australian State Branch of the Returned Sailors & Soldiers’ Imperial League of Australia similarly developed during the interwar period a simple ceremony of silence for departed comrades at 9pm, presumably to coincide with the traditional 11am time for Armistice ceremonies taking place in Europe (due to the ten-hour time difference between Eastern Australia and Europe). In the United Kingdom, beginning in 1939, the two-minute silence was moved to the Sunday nearest to 11 November in order not to interfere with wartime production should 11 November fall on a weekday. After the end of World War II, most Armistice Day events were moved to the nearest Sunday and began to commemorate both World Wars. The change was made in many Commonwealth countries, as well as the United Kingdom, and the new commemoration was named Remembrance Sunday or Remembrance Day. Both Armistice Day and Remembrance Sunday are now commemorated formally in the UK. In recent years Armistice Day has become increasingly recognised once again, and many people now attend the 11am ceremony at the Cenotaph in London – an event organised by The Western Front Association, a UK charity dedicated to perpetuating the memory of those who served in the First World War. In Bloxwich and across Walsall Borough, many local people will marking Armistice Day in their own way today, at War Memorials, in schools, in the workplace, and in quiet moments at home. The Bloxwich Telegraph will be marking the day with two minutes of silence at 11am, and by attending the rededication of Elmore Green School War Memorial this afternoon. The Stan Ball Centre will be hosting a Remembrance Day event with a difference on Sunday 13 November. The usual monthly indoor car boot sale will be dressed in Union Flags and the Support Our Soldiers charity will be supported at the event . This includes the launch of a used stamp appeal. A box has been set up in the Stan Ball reception area and used stamps can be taken into the centre and will be forwarded on to support the Support Our Soldiers used stamp appeal. The appeal will continue throughout the year, and stamps can be dropped in at anytime on weekdays. There will be a one minute silence at 11am and wartime music will be played throughout the day. Probably quite uniquely for an event taking place on Remembrance Sunday there will be for the first time an Ann Summers stall selling fun ideas for Christmas. The event takes place at the Stan Ball Centre, Abbotts Street, Bloxwich from 11am to 3pm. Admission is free. Telephone enquiries to Karen Smith at the centre on 01922 403351. Arrangements for this weekend’s Remembrance Sunday commemoration in Bloxwich have been announced. The traditional parade of veterans, relatives, youth groups, councillors and other organisations will take place along the High Street starting at 10.20am from near the Bull’s Head. A religious service of remembrance led by local clergy, including the reading of the Bloxwich, Blakenall and Leamore Roll of Honour, will then take place at Bloxwich War Memorial near the Elmore Green Road junction of High Street at around 10.40am. This will be followed by the laying of wreaths by local dignitaries and organisations as well as small crosses and individual poppies by members of the public. All are welcome to attend. Zeppelin L21 berthed at Nordholz, 1916, and the crater it left in Bradford Place. A very rare 20lb German incendiary bomb casing, which was dropped on Walsall in 1916 during the Great War, has gone on show in a new display at Walsall Museum. The bomb casing, which is so rare that it may be the only one held in a British museum, is believed to be one of those dropped on Walsall during the night of 31 January 1916, when the Black Country suffered one of the heaviest air raids of the ‘war to end all wars’. Tipton, Bradley, Wednesbury and Walsall were bombed by two Zeppelins, leaving 35 people dead. One bomb landed on Wednesbury Road Congregational Church, but thankfully no-one was killed, while another landed in Bradford Place, and claimed the lives of three people, including 55-year-old Mary Julia Slater, the Mayoress of Walsall. She was a passenger on the number 16 tram when the bomb hit, and suffered severe wounds to the chest and abdomen. She was taken to hospital and died a few weeks later on February 20th from shock and septicaemia. Walsall’s Cenotaph now stands on the spot where this bomb landed and also destroyed the public toilets in the gardens outside the Science & Art Institute, which is why new ones were later built beneath Sister Dora’s statue on The Bridge. 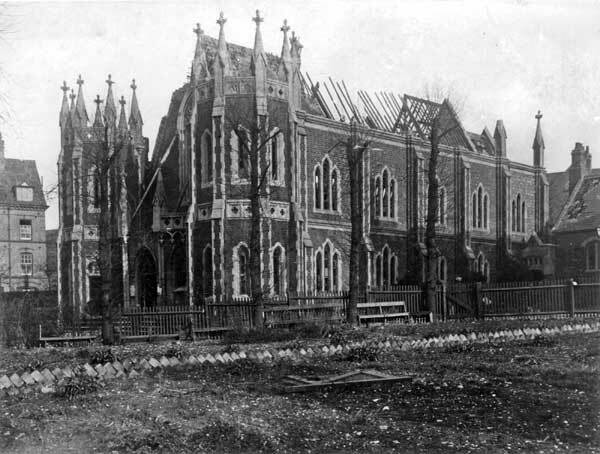 Wednesbury Road Congregational Chapel after the Zeppelin raid, 1916 (WLHC). Also on display in the museum is a fragment of leaded window from the Wednesbury Road Congregational Church, the roof of which was destroyed during the raid. The display, entitled Walsall’s Zeppelin Raid, can be seen in Walsall Museum’s local history gallery, The Changing Face of Walsall, from Tuesday 1 November until Saturday 3 December 2011, and is particularly poignant at this time of year. The bomb casing no longer contains any incendiary material and is certified as safe. For further information on the display please contact Walsall Museum on 01922 653116 or email museum@walsall.gov.uk. Walsall Remembrance Sunday. Picture by Frank Smith. Charges will be waived at all council-owned car parks in Walsall throughout Remembrance Sunday for the second year running, it has been announced today. The council waived its charges for one day last year after considering the views of veterans and others involved in the town’s civic parade.